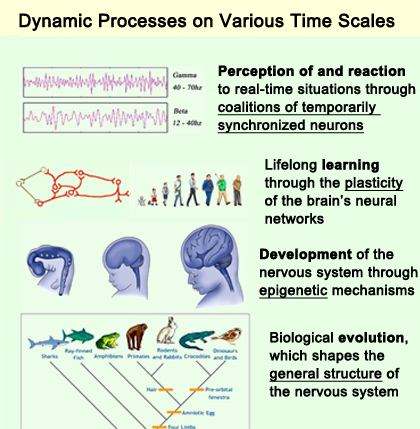 Today I want to talk about dynamic processes that occur on some very different time scales in the human nervous system. To do so, I will describe four examples very briefly, referring to the two graphics in this post. The first of these processes, represented at the bottom of each graphic, is the evolution of the human nervous system, which occurs on the longest of these time scales, measured in millions of years. Over these very long periods, sexual reproduction has accelerated the diversification of our nervous systems by regularly producing variants or mutations. Some of these variants have proved capable of viable structural couplings with certain environments and have thus enabled their lucky owners to pass these nervous systems down to their descendants. I am purposely avoiding saying that these nervous systems are “better adapted to their environment”, so as not to imply that part of this environment is unchanging or that there is always some optimal level of adaptation that organisms can achieve. To state it succinctly, evolution is more proscriptive than prescriptive: it of course eliminates certain mutations that are too incapable of viable coupling with their environment, but it “allows” all the rest. The dynamic processes that occur on the second time scale consist of epigenetic phenomena. Various kinds of phenomena can be described as epigenetic, a term the general meaning of which is “after the genes”. But I am thinking about two kinds of phenomena in particular. In the first case, certain molecules bind to our DNA and in the process do not alter its sequence but do alter its expression. Such processes can occur at any time in a person’s life and depend on environmental influences (what that person eats, what stressors he or she is subjected to, and so on). Researchers have also discovered that these epigenetic modifications, favouring or suppressing the expression of a given protein, seem to be transmissible from one generation to the next. So in this case, we are talking about a time scale of a few years, decades, or centuries. In the second kind of epigenetic phenomena, as an individual’s brain develops during the first years of life, the activity of the nervous system causes the “pruning” of certain neurons and synaptic connections that that are too numerous or inefficient. Thus the nervous system learns not only by increasing the efficacy of certain synapses, but also by eliminating those synapses that cause it to make errors. In this case, the time scale is on the order of years. The processes occurring on the third time scale are those of neuronal plasticity in the common sense. The connections between the axon of one neuron and a dendritic spine on the following neuron form a highly dynamic structure known as a synapse. The synapse is constantly undergoing molecular changes that facilitate or impede the passage of nerve impulses. Some of these synaptic changes are biochemical and last only a few minutes or hours. Others involve the synthesis of proteins and result in changes in the very form of the synapse, such as an increase or decrease in its size. These structural changes can last days, weeks, or even, in the case of our oldest memories, an entire lifetime! Lastly, on the fourth time scale, we have the dynamic processes due to the electrical activity in the neural networks of the brain. These are the fastest processes, occurring in seconds or even milliseconds. Examples include phenomena such as sensory perception, decision-making, and the physical movements that we make very quickly and, the vast majority of the time, completely unconsciously. In these cases, oscillation and synchronization phenomena enable groups of neurons to form temporary, ephemeral coalitions to perform certain tasks. Thus, at any given moment, your brain is literally the product of all these dynamic interactions on all these time scales!